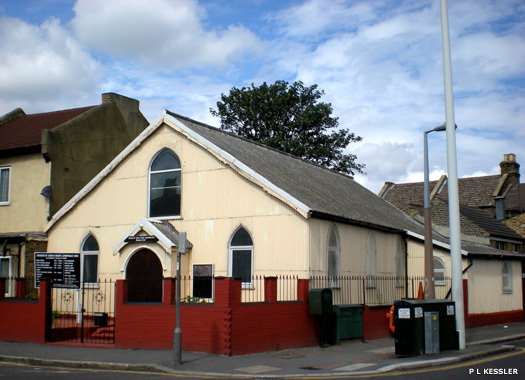 The Church of Jesus Christ Apostolic is at 84 Ramsey Road, Cann Hall, to the south-east of Leytonstone 'village'. Much effort was concentrated on bringing church missions to the poor, overcrowded districts of Harrow Green and Cann Hall in the period between the 1850s and 1890s, when Victorian missionary zeal was at its height both at home and abroad, and this non-conformist example, whose history cannot be confirmed, seems to be one such example. St Anselm Mission Church, on Pevensey Road, Cann Hall is now called Church House. A stone laid when it was rebuilt as a private dwelling reads: 'This stone was laid on the 7th day of June 2000... to commemorate the original foundation stone laid on the 20th day August 1896'. The white cross on the roof is inscribed with the church name. It was originally a mission room for St Margaret's Church which became the mission church of St Anselm in 1906. It closed down by 1926. Cann Hall & Harrow Green Baptist Church originated in 1875 in mission services held by 'The Christian Band' in a barn at Cann Hall Farm. A church was formed in 1878 and the barn converted into a chapel. 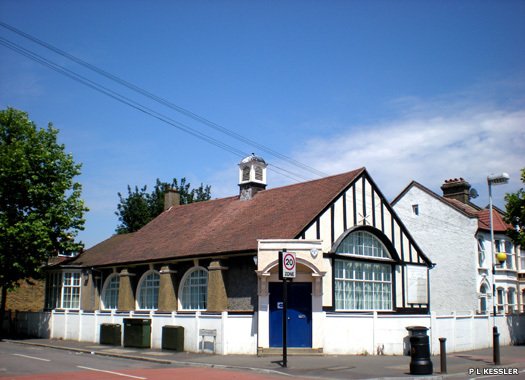 In 1881 a small chapel (now the lecture hall) was opened in Cann Hall Road, and was handed over in 1885 to the London Baptist Association. They built the present church designed by G Barnes and opened in 1887. Between 1926-1966, membership dropped from 391 to 89. Holy Trinity Church, on Corn Way, serves the parish of Harrow Green in South Leytonstone. It lies on a post-war estate between the High Road and St Patrick's Catholic Cemetery. 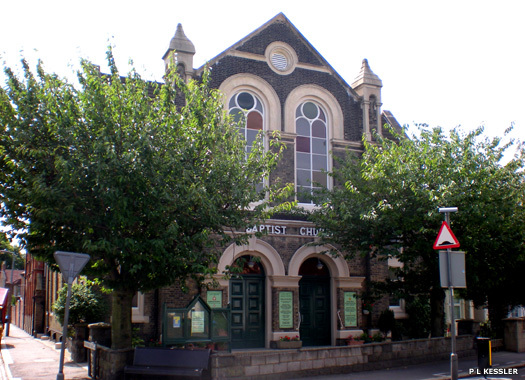 The church originated as an iron mission church on Birkbeck Road in 1874 for St John the Baptist Church. The permanent church, a plain brick building with painted windows, was opened in 1878. The church was damaged in the Second World War but restored, apparently without any windows at all. St Augustine of Hippo is now combined with Holy Trinity, but it began as a mission church on nearby Lincoln Street, and in 1886 an iron building was provided in Mayville Road, one street north. This was replaced in 1889 by a temporary brick church and in 1902 a plain, permanent church was opened on Lincoln Street. In 1915 it was gutted by German incendiary bombs dropped from Zeppelins, but was restored in 1920 and renovated in 1953, before complete closure sometime later. 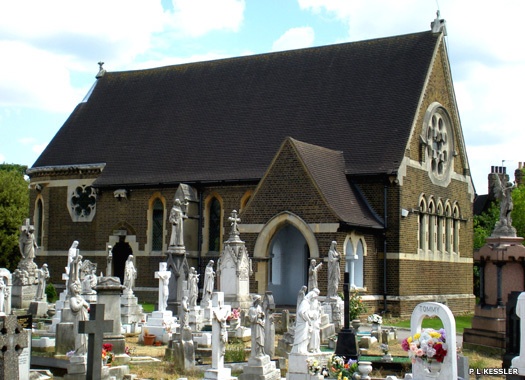 St Patrick's Catholic Cemetery is on Langthorne Road (formerly Union Road). 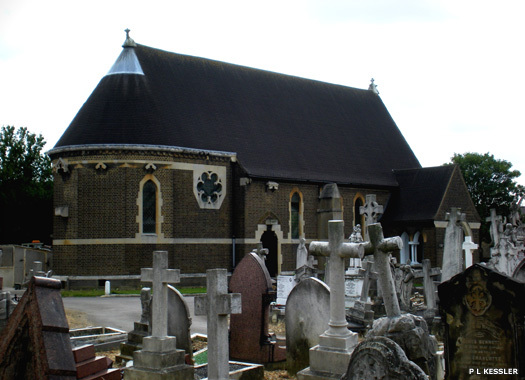 According to the 1863 Whites Directory entry for Leytonstone, the cemetery was opened in 1861, and extends over eleven and-a-half acres. It was provided by the London Roman Catholics. There are 147 Commonwealth burials from the First World War and 134 Commonwealth burials from the Second World War here, but the area closest to the brown-brick chapel building is a maze of headstones. Nearby Etloe House was leased in 1856 as a country house for the first Roman Catholic archbishop of Westminster, Cardinal Wiseman, who lived there from 1858 to 1864. But there was no Roman Catholic church in Leyton until 1897. The cemetery is also where the Irish-born Mary Jane Kelly was laid to rest, the last of the five confirmed victims of Jack the Ripper. She was killed in 1888 at the age of twenty-five. 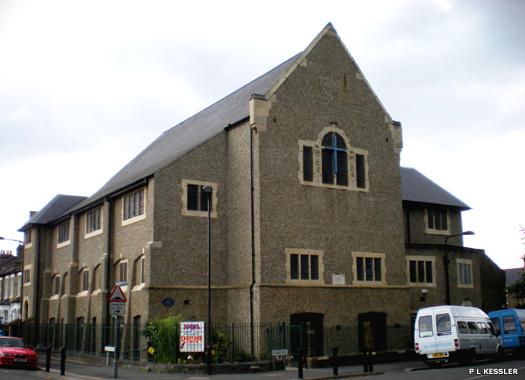 New Testament Assembly church (a registered charity) is in Langthorne Road, Cathall, Leytonstone. 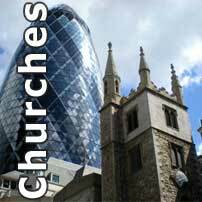 Began as a mission for Grove Church, Stratford, the Fetter Lane Church organisation moved to Leyton from London in 1894 and in 1900 the current, strikingly original, Fetter Lane Congregational Church building was opened, designed by P Morley Horder. It is a Grade II listed building and since the early nineties has played host to the NTA Club for the elderly and infirm. 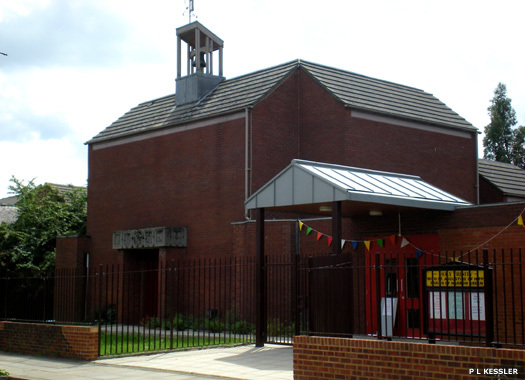 Leytonstone Christian Centre (London City Mission) is a former undenominational church on Grove Green Road. It began in 1903 in a house in Pearcroft Road, but an an iron hall, called Bethsaida, was built in 1906 on this site in Grove Green Road. In 1912 the widow and family of Josiah Goodman built the larger, permanent, Goodman Memorial Hall, designed by W Hood. 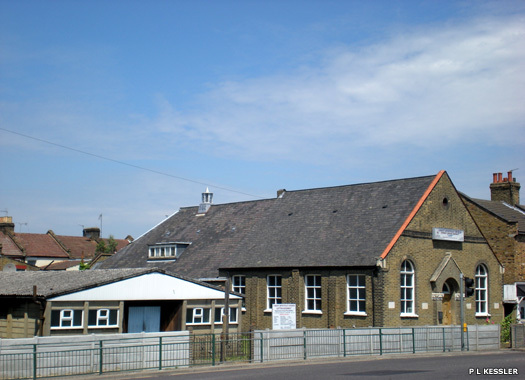 In about 1938 the hall was handed over to the London City Mission, which is still in charge. 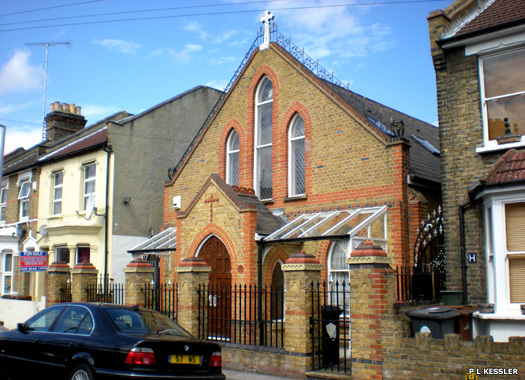 Christ Apostolic Church, Leyton Assembly, lies just a few doors to the south of the London City Mission, but describes itself as being in Leyton instead of Leytonstone. It started off in 1887 with Free Methodist services in a cottage in Pearcroft Road. 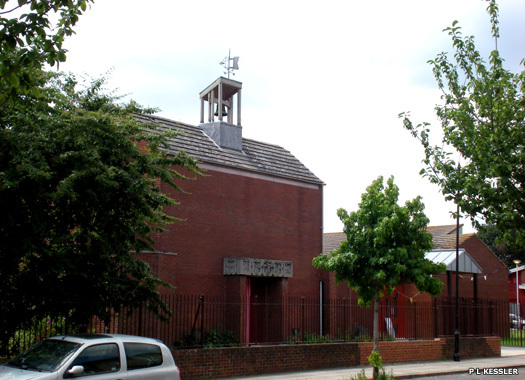 A society was formed in 1889 and the small brick Grove Green Road Methodist Church was built in Grove Green Road with the help of Richard Mallinson. The church was enlarged in 1906 and was still Methodist in 1954.